This little article attempts to introduce the research that professor Charlotte Hemelrijk and her group “Behavioural Ecology and Self-organization” at the University of Groningen perform on understanding the complexity of bird flocks and fish schools. In the context of the Honours College course “Leadership or Not in Animal Societies” the questions was addressed whether a single leader is necessary to organize the complex behaviour that one can observe in large and moving fish schools or bird flocks. Is a leader required to guide the instant movement of thousands of birds or fish into one direction in order to find food or escape an enemy? Or is some kind of intrinsic property that emerges from the school or flock sufficient to explain the observed behaviour? In the following I will describe how the estimation of movements parameters, computer simulations, and the careful observation of fish schools in nature led to a robust model that can explain why no leader is necessary to coordinate the movement of fish schools. For fish it is very attractive to organize in schools because spawning an area, finding food, access to mates, protection from predation and hydrodynamic effects all become more optimal for the individual fish. In order to understand how complex school behaviour evolves it first became necessary to be able to describe the formation of a school in general. It has been hypothesized that collective movements, as they occur in a school, are characterized by a directional and temporal coordination. This coordination might only become possible if individuals mutually influence each other by the distance towards other members of the school (Huth and Wissel, 1992). Fig. 1 shows which effects the distance of one to another fish has on its movement according to the formulated hypothesis. These parameters were then used in a computer simulation in order to test whether the resulting model schooling behaviour resembled the natural schooling behaviour. Interestingly, the parameters seemed to be sufficient to describe the natural behaviour (Fig. 1 (C)) that has been noted earlier (Partridge, 1981). Fig. 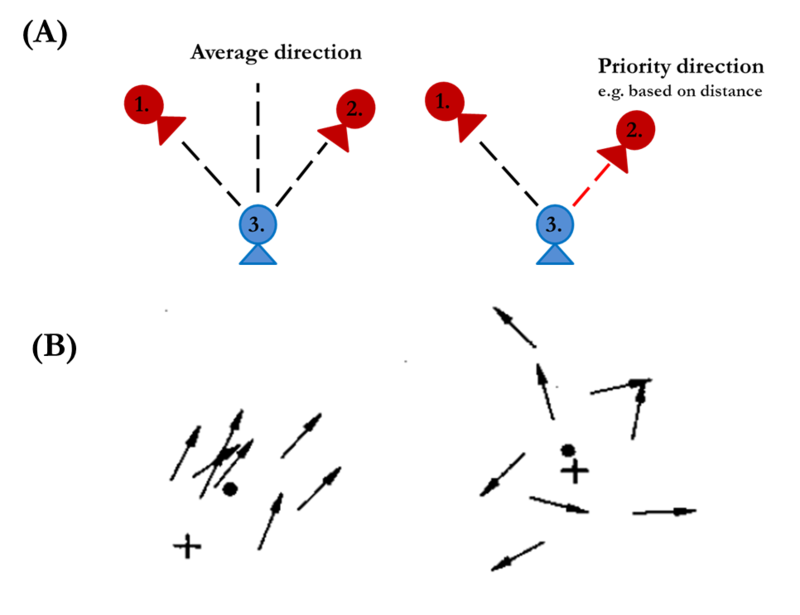 1: Hypothesized effects of the presence of a second fish on the movement of the first fish depending of the distance to each other. (A) and (B) display how a first fish reacts when a second fish is present in four different proximity zones (based on Huth and Wissel, 1992). (C) shows how the modelled fish schooling behaviour (bottom) clearly resembles the observed behaviour in reality (top) (based on Partridge, 1981). Based on the above described parameters attraction, alignment, and avoidance further studies were able to significantly link the behaviour of individual fish to distinct school shapes. However the researchers needed to introduce the factor “speed” into their model in order to being able to reproduce observations in nature (Kunz and Hemelrijk, 2003 and Hemelrijk and Hildenbrandt, 2008). The researchers found that through coordination and collision avoidance a transition to an oblong shaped (with respect to movement direction) school occurred as a function of speed. In other words, a fish school reduced its width and increases its lengths at increasing velocities because this enables the individual fish to avoid collisions. Later, Hemelrijk and colleagues were able to prove that the conclusion drawn from their model also holds true for fish schools in real-life experiments (Hemelrijk et al., 2010). In order to narrow the gap to the experimental observations, the researchers also introduced a factor to describe the effect that the number of neighbours have on the movement decisions of the fish. They hypothesized the existence of two mechanisms that could govern the movement of individual fish when surrounded by more than one neighbouring fish. Fig. 2 schematically depicts both hypothesis and their respective outcomes in computer model when applied over a number of “decision cycles”. The first model assumes that the movement of an individual fish (3.) who has at least two neighbours (1. and 2.) in his field of view largely is the result of taking the average path between both fish. The second model was assumed to be more realistic because the fish (3.) would have a priority direction that largely depends on factors such as distance to his neighbour. A computer simulation of both models, however, resulted in a surprising outcome. After a number of cycles the priority model had led to a disturbed school pattern that is never observed in nature. On the contrary, the average direction model resulted in an accurate reproduction of field observations. The researchers therefore assumed that the priority direction effect is probably averaged out in a large school because there are many and changing neighbours. The final result is an average directional movement. Fig. 2: Two models and their simulation results that take neighbouring fish into account during the movement decision process of an individual fish. (A) The average direction model assumes that the movement of fish 3. is the result of averaging between the direction of its neighbours. The priority direction model assumes that fish 3. decides to follow the closest neighbour. (B) Simulations of both models resulted in a dispersed fish distribution in the case of the priority model (right) and a more realistic ordered fish distribution for the average model (left). The findings presented in Fig. 2 and the fundamental work presented in Fig. 1 therefore prove that individual fish can lead to an emergent property, such as the coordinated behaviour of a large group, without requiring a leader. It is important to note that the individual perceptions of the fish within and on the edges of the school are vital for the coordination. This means that the final direction of the fish school is probably and to a large extend based on the “decisions” that fish on the edges of the school make. These movements “decisions” might be based on knowledge and experience, but also on motivational factors such as hunger. Whether these factors can drive the behaviour of individual fish and therefore the movement of the whole school still remains to be elucidated. The computational tools of theoretical biology therefore seem to be a good approach to describe complex behavioural patterns in animals groups. Other research projects of the Hemelrijk group used similar parameter-simulation approaches to describe the behaviour of bird flocks and their internal dynamics (Hildenbrandt et al., 2010). Also in bird flocks no real leader is necessary, but the individual movement decisions of birds in their neighbouring context seem to govern the movement of the flock as a whole. These studies can also help to improve understanding on how large groups of humans act in situations of panic and fear when rational decisions might become overruled by movement decisions that are based on the individual context. Hemelrijk, C.K., and Hildenbrandt, H. (2008). Self-Organized Shape and Frontal Density of Fish Schools. Ethology 114, 245–254. Hemelrijk, C.K., Hildenbrandt, H., Reinders, J., and Stamhuis, E.J. (2010). Emergence of Oblong School Shape: Models and Empirical Data of Fish. Ethology 116, 1099–1112. Hildenbrandt, H., Carere, C., and Hemelrijk, C.K. (2010). Self-organized aerial displays of thousands of starlings: a model. Behavioral Ecology 21, 1349–1359. Huth, A., and Wissel, C. (1992). The simulation of the movement of fish schools. Journal of Theoretical Biology 156, 365–385. Kunz, H., and Hemelrijk, C.K. (2003). Artificial fish schools: collective effects of school size, body size, and body form. Artif. Life 9, 237–253. Partridge, B.L. (1981). Internal dynamics and the interrelations of fish in schools. J. Comp. Physiol. 144, 313–325.